A moment that will last forever, wedding is a sacred path to eternal love. There is no better way to exchange vows and cherish the unforgettable wedding moment in Bali others than at Noah Wedding Chapel, a true symbol of spiritual history that will make your love stories embraced through time. 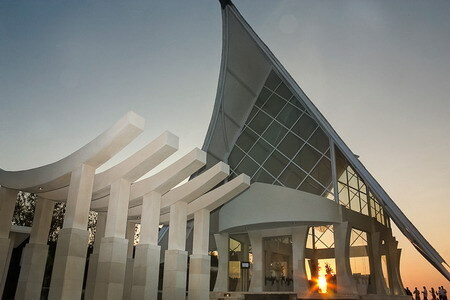 With minimalist Yat elegant design, Noah Wedding Chapel in Bali is designed to take your breath away by the time you arrive on top with the infinite scenery of Jimbaran bays and foliage. As the background music takes you to a more intimate stage further down the aisle and closer to your loved ones, the natural lights coming through the transparent glasses of Noah Wedding Chapel will cascade your memories into a romantic wedding in Bali’s history. 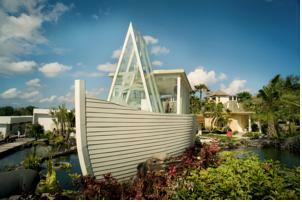 As the name suggests, Noah Wedding Chapel design depicts the biblical story of Noah’s journey in a majestic ark. The ark is a beautiful ship-like building with a modest meeting room on the ground floor and topped with a stylish white chapel, Noah Wedding Chapel. The chapel is surrounded with lively koi ponds that symbolize prosperity and longevity, such water feature transcends Noah Wedding Chapel to become the wedding chapel in Bali to hold your memorable wedding. 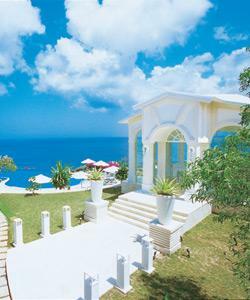 Noah Wedding Chapel has witnessed some of the most unforgettable wedding vows exchanges in the renowned island of the Gods. 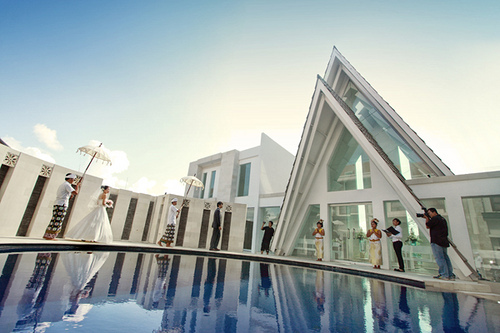 We offer you the unique experience of a tailor made wedding in the idealistic paradise of Bali Island. The Wedding Pavilion “AMANDA” means lovely and cute. It is located in Tuban area and very close to the airport. The Pavilion is a compact wedding space which is ideal for an intimate ceremony from 2 to 30 people. The chapel also provides air-conditioned make up room and waiting room. 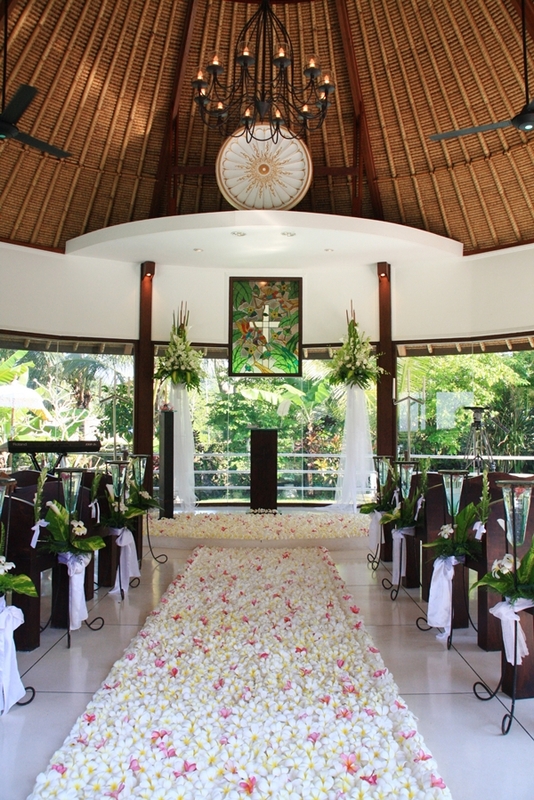 Ceremonies are held twice a day so you can organize the wedding of your dreams for your special day. Puri Taman Sari Chapel surrounded by a natural view of rice field at Marga Village Tabanan – Bali. Your dream wedding at Puri’s unique glassed pavilion (chapel) can be in Western or Balinese tradition. Also you can be blessed or renew your vows in this special place in a very memorable way. Complete wedding services available. “One moment of true romance reveals the eternal love. With the special privileges, Blue Point Bay Villas offers most romantic ambiance to set the mood for love.” Marriages are made in heaven. Two halves of one soul united, destined to be together throughout eternity. Let the journey to eternity begins in a glass chapel on the tip of the top of Uluwatu cliff and overlooking the breathtaking sunset view at Blue Point Bay Villas & Spa. If you have always dreamed of holding your wedding in a location that evokes majesty, spirituality and unity with nature there can be no other choice than the Ritual Wedding Chapel.Dramatically situated on the cliffs of Uluwatu the Ritual Wedding Chapel combines modern architectural design with traditional Balinese themes to create a uniquely sophisticated venue that will take your breath away.This private retreat has been designed to honour the sanctity of your marriage vows and to reflect the importance of the marriage ritual. With seating for up to 60 guests within the Chapel, and with standing room for many more, the Ritual Wedding Chapel can cater for any sized wedding. The grand entrance to the chapel doors sets the scene. Stunning archways leading to a stairway over a cascading waterfall leads you to the double glass doors of the Chapel. Soaked in the purity of white, the Chapel has luxurious white marble flooring which reflects the natural light that bounces off the water surrounding the entire venue. With floor to ceiling windows the panoramic views can be enjoyed whilst sitting in the air-conditioned interior. Shimmering crystal chandeliers adorn the ceiling giving the sense of grandeur and magic befitting the sacred occasion. The manicured lawns and tranquil reflection pool that surround the Ritual Wedding Chapel add to the stylish ambiance and provide the perfect location for your wedding reception. Your wedding day will become one of your most treasured memories. 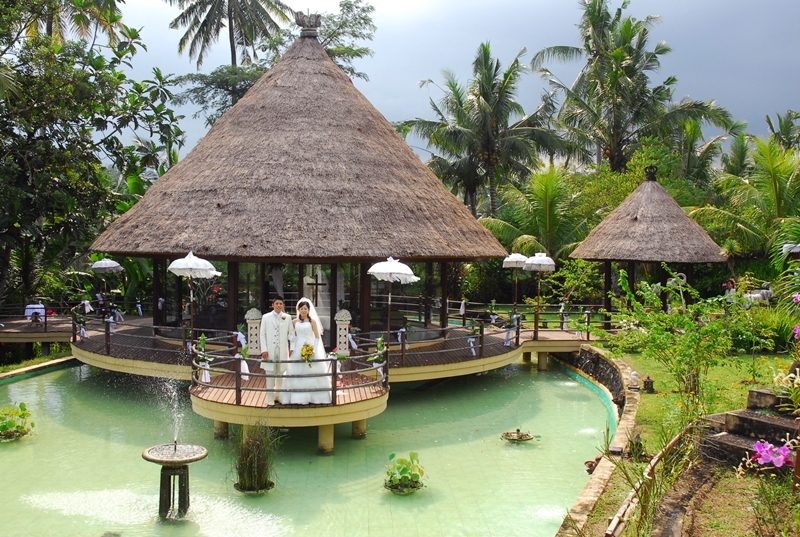 The Ritual Wedding Chapel is the premier wedding venue in Bali. 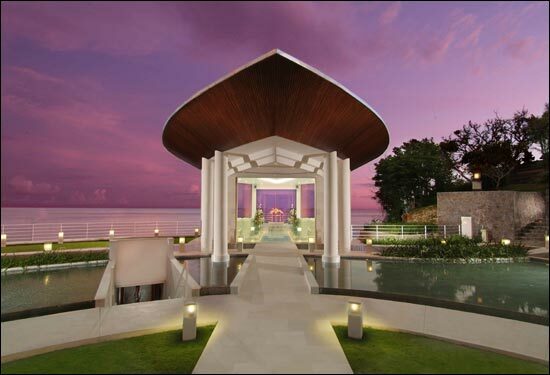 Capturing sweeping 180 degree views of uninterrupted Indian Ocean scenery, the exclusive Wiwaha Wedding Chapel & Shamita Reception complex is secluded on a picturesque cliff top at Nikko Bali Resort & Spa. This dedicated setting for intimate wedding ceremonies and receptions provides an exquisite venue to celebrate love and exchange marriage vows before an audience of family and friends. Bathed in natural sunlight, this magnificent split-level glass structure makes a bold statement in contemporary Balinese design and personifies the spirit of the tropics. Embarking on a lifelong journey of love and commitment, it should be a day to remember. A fully customizable wedding package for your big day. Legal weddings, Blessing weddings, Villa weddings or wedding receptions. Tell us your dream vision and we will make it happen.